ROBE DESIGN are Ireland's leading manufacturer and installer of Sliding Door Wardrobes and Sliding Door Storage solutions. With showrooms nationwide it's very easy for you to find us and talk to a specialist designer. 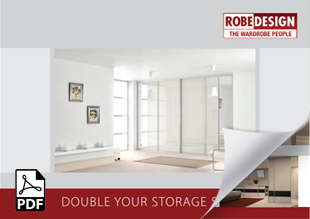 At ROBE DESIGN we want you to enjoy the experience of specifying and configuring the best looking sliding door systems and storage solution for your rooms. Our professional and curteous customer service staff will make the task a lot simpler, and our designers will work wit you closely to de-clutter and maximise your available storage space. Our design expertise is supported by 30 years experience. We provide our customers the best in CAD design rendering, which we use to give you a “virtual reality” picture of the final design and layout of your new sliding wardrobe or walk-in wardrobe in your room. We will discuss every detail of your requirements in order to help you optimise your space whilst also considering your preferences in colour schemes, layouts and door styles, to build the best outcome for you. Remember; our home design service is "free of charge" and there is no obligation to buy.